, while the Guelph Gryphons earned the school's first women's title in school history with a 1-0 win over the McGill Martlets. 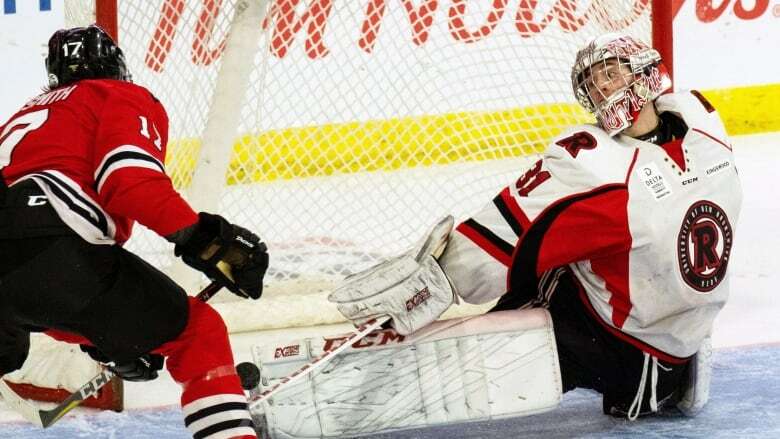 Alex Dubeau made 32 saves as the University of New Brunswick Reds doubled up the Alberta Golden Bears 4-2 on Sunday to capture the U Sports men's hockey championship. Samuel Dove-McFalls, Oliver Cooper, Kris Bennett and Mark Rassell supplied the offence for New Brunswick, which earned its eighth national title in program history. Steve Owre and Brandon Magee hit the scoresheet for Alberta, the defending U Sport champions. Zach Sawchenko stopped 27 shots in defeat. Every men's title dating back seven years has been won by either the Reds or Golden Bears. UNB also won in 2013, 2016 and 2017, with the Golden Bears claiming the University Cup in 2014, 2015 and 2018. Earlier in the day, Chase Marchand made 48 saves and Adam Holwell struck twice as the St. Francis Xavier X-Men beat the Saskatchewan Huskies 5-1 to claim bronze. Matt Needham, Matthew Graham and Cole MacDonald also scored for St.FX. "It's a tough game to play and challenging for the guys. But it speaks to the character of this group, they cared a lot about this game and they wanted to win this game and I think that showed this afternoon," said St.FX head coach Brad Peddle. Parker Thomas found the back of the net for Saskatchewan. Travis Child turned away 11-of-16 shots in a losing cause. The Guelph Gryphons have earned their first women's hockey national title in school history. Valerie Lamenta stopped all 20 shots she faced as Guelph held on to beat the McGill Martlets 1-0 on Sunday in the U Sports final. Kaitlin Lowy gave the Gryphons all the offence they needed at 18:15 of the second period, with Lamenta making 10 of her saves in the third period to preserve the championship. "I pretty much blacked out," Lowy said of her goal. "I haven't had time to digest the magnitude of this, but right now I'm just really proud of this team and we're honoured to be part of a historical championship." Lamenta was named tournament all-star. "It's been an amazing five years at Guelph," said Lamenta. "But this is really a dream come true being able to say this is my last game in a Guelph Gryphons jersey." Tricia Deguire turned away 20-of-21 shots for McGill. Earlier, the Montreal Carabins pulled off the upset with a 2-1 victory over the top-ranked Alberta Pandas to win the bronze medal. Kelly-Ann Nadeau and Alexandra Boulanger scored in the second period for Montreal as Aube Racine made 23 saves for the win. "Everybody in that room wanted to work for the other person next to them and I think that made the difference," said team Carabins captain Valerie St-Onge. "It's a first experience for a lot of them, and to win a medal at nationals is just overwhelming." Kennedy Ganser was the lone scorer for Alberta. Kirsten Chamberlin stopped 11-of-13 shots in defeat.